NL Deze gebruiker accepteert de Nederlandse taal op zijn overleg. This user accepts the Dutch language on his talk. This user reads The 'Shroom! Red This user's favourite colour is red. This user knows Yoshi's insides are bigger then his outsides. This user printed A4 AR-cards. This user is quick. Lakituthequick. Hey everybody who is on this page! I am Lakituthequick, member of the MarioWiki and someone who occasionally makes edits. Why I am called "Lakituthequick"
The first time I played a Mario game, it was Mario Kart DS. I saw Lakitu and found him a funny character, I didn't know his name, and because I never played another Mario game before, I didn't know he is an enemy in most of them. 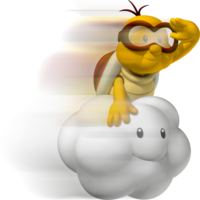 Now the thequick part: I saw Koopa the Quick in Super Mario 64 DS and combined the two in Lakituthequick. And then we reach the point of reaching the end of the page but the userboxes continue. Have a picture of our lord and saviour. This page was last edited on March 11, 2018, at 13:16.